The Red Lake Miners stormed out to an early three-goal lead and never looked back in skating to a well-deserved 6-1 victory over the Thunder Bay North Stars Saturday, April 13th in game one of the Superior International Junior Hockey League Bill Salonen Cup Final at the Fort William Gardens. 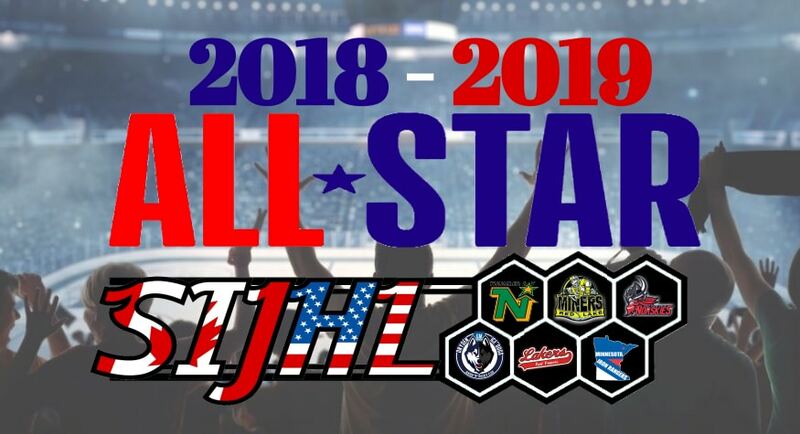 The Superior International Junior Hockey League announced Thursday, April 11th its first and second all-star teams, for the 2018-19 season. FORWARD: BRYCE YOUNG, RED LAKE MINERS – The 19-year-old The Pas, Manitoba product, had a tremendous campaign in the SIJHL, while also leading Red Lake in offensive production. … His 60 goals during the regular season were the second-most markers in a single campaign by any skater in league history. … He also went on to add 41 assists for 101 total points. … Young topped all SIJHL skaters in both power play and shorthanded tallies with 15 and seven respectively while chipping in with five game-winning markers. … Among his other notable accomplishments in 2018-19 were registering a point on over 36% of his team’s tallies during the year; topping the league in shorthanded points with nine and being named to compete in the SIJHL All-Star Game where he dished out a pair of assists. … He was earlier named the SIJHL Rookie of the Year as well for his contributions on the ice with Red Lake. DEFENCE: CONNOR BOWEY, THIEF RIVER FALLS NORSKIES – In just 48 contests, Bowey finished second in scoring among SIJHL defencemen with 62 points as he notched 16 goals and dished out 46 assists. … The 20-year-old from Winnipeg, Manitoba was third in power play assists among defensemen with 11 and was second in game-winning goals with three. … In his productive three-year career in the SIJHL, Bowey played at close to a point-per-game pace for the Norskies with 118 in 129 outings as he scored 30 times and doled out 88 helpers. DEFENCE: KYLE AUGER, THUNDER BAY NORTH STARS – Auger was a unanimous selection in voting for SIJHL Top Defenceman honours. … The 20-year-old Thunder Bay product had a tremendous campaign leading all SIJHL defencemen in goals (33), assists (69), points (102), game-winning goals (8), power play tallies (8) and man advantage assists (19). His overall point total established a league record for the most in a single season by a blueliner. … His overall offensive totals saw him finish in a tie for top spot, but was credited as the runner-up due to less goals scored; eight less than teammate Keighan Gerrie. 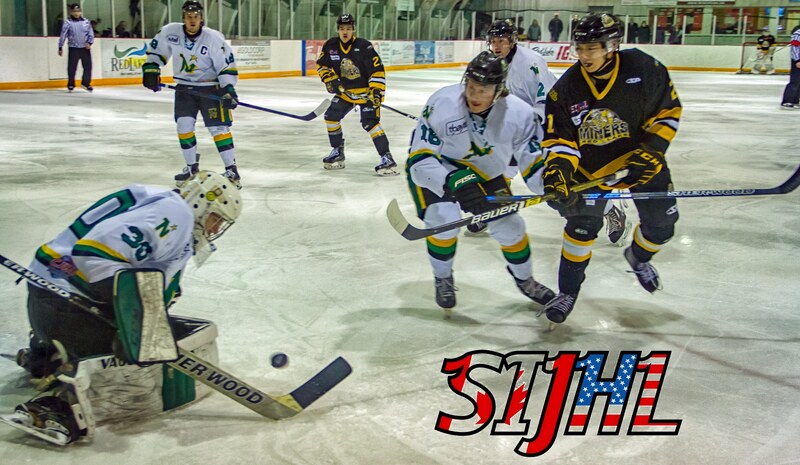 … Auger was selected to take part in the SIJHL All-Star Game and was named a league 1st Team All-Star on defence in 2018-19. FORWARD: ERIC STOUT, DRYDEN GM ICE DOGS – Earns second-team accolades for a second straight season. … The veteran forward led Dryden in offensive production and finished seventh in SIJHL scoring with 77 points. … Stout’s 40 goals were the fourth-most supplied in the league in 2018-19. The 21-year-old from Brainerd, Minnesota was tied for second overall in power play assists with 14. … Stout wraps up his SIJHL career with 199 points to his credit as he notched 99 markers in total and hit the century-mark in assists with 100. 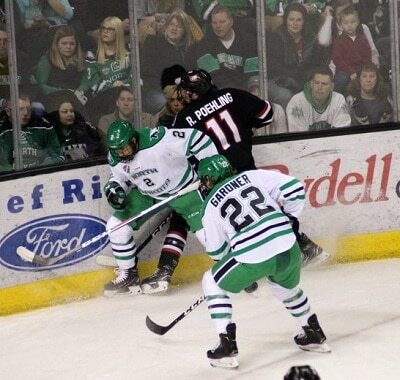 FORWARD: BOE BJORGE, THIEF RIVER FALLS NORSKIES – In 56 outings during the course of the 2018-19 regular season, the 20-year-old Grand Forks, North Dakota product racked up 81 points on 29 goals and 52 assists to lead the Norskies in scoring and also finish sixth overall among all league skaters. … This marked an impressive 66-point improvement for Bjorge from the 2017-18 campaign with Thief River Falls. … Among his efforts was a 19-game point streak that ran from October 31 through to January 9 while also producing a SIJHL season-best 16-game point run in road match-ups for his club. … His efforts earned him league Most Improved Player laurels for 2018-19. … In 90 career SIJHL contests, Bjorge produced at over a point-per-game clip with 96 on 38 tallies and 58 helpers. FORWARD: JOEL WILLAN, THUNDER BAY NORTH STARS – Willan had a solid regular season for the North Stars, amassing 87 points in just 55 outings while scoring 22 times and doling out 65 assists. … His assist total was the second-highest amount in the league. … The 19-year-old forward hails from Nipigon, Ont. … He sported point streak of seven games or more on three different occasions in 2018-19. DEFENCE: KEILAN TOEWS, RED LAKE MINERS – A solid presence on both ends of the ice for the Miners, Toews was a rock for Red Lake this season. … Not only was he a distinct contributor for his squad in the defensive zone, he also finished up third in scoring among all SIJHL blueliners. … In all, the 19-year-old Langley, British Columbia product notched three goals and helped set-up 37 others for 40 points. … Toews was also pivotal on special teams for the Miners during the campaign as he dished out 14 power play assists and had six more while his club was shorthanded. DEFENCE: RYAN BRANDT, DRYDEN GM ICE DOGS – After being recruited by Dryden in late November, Brandt helped the GM Ice Dogs turn their fortunes around in the second half of the season. … In the 23 games in which he registered at least one point, Dryden went sported a solid 15-5-3 record. … In all, the 18-year-old from Maple Grove, Minnesota produced 33 points in 37 contests and was a strong contributor in bolstering the GM Ice Dogs back-end. GOALTENDER: ZACH WILLMS, RED LAKE MINERS – Willms was second in the SIJHL in wins with 25 helping Red Lake finish in second spot in the league standings. … Despite missing a number of games due to injury, the 19-year-old from Camrose, Alberta topped all SIJHL netminders in minutes played at 2,086. … Willms was also third overall in saves with 1,160 as well as in save percentage at .921 while being knotted for fourth in shutouts with two. 21-year-old veteran Fort Frances Laker forward Jaedin Ness has committed to the College of St. Scholastica hockey program for the fall of 2019. 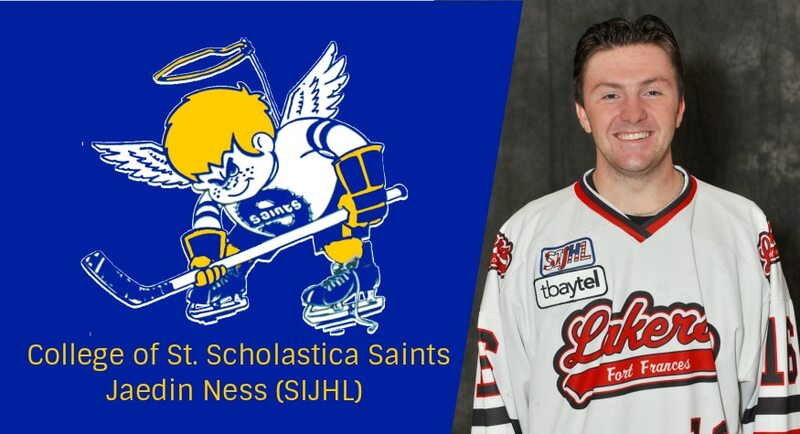 The Wayzata, Minnesota native will join the Northern Collegiate Hockey Association (NCHA) Saints after playing the last two seasons in the Superior International Junior Hockey League with the Lakers in Fort Frances, Ontario. In 97 regular season games from 2017 – 2019, the 5’10” and 170 lbs forward scored 52 goals and 28 assists along with accumulating a total of 47 minutes penalties. In 97 games with the Lakers, Ness registered seven powerplay regular-season goals in Fort Frances. In 12 postseason games with the Fort Frances junior ‘A’ franchise, Jaedin added three goals and three more assists for the Lakers. “The Saints program is getting a hard worker, a player that has passion, respects the game and someone who wants to succeed to help the team,” said Strachan. The 2018/19 Dryden GM Ice Dogs hockey season came to an official end after Monday, April 8th Awards Banquet. A total of twelve awards were handed out to the team’s top performers. As well, outgoing 20-year-old players had the opportunity to share their parting comments about this past season what it meant to be a Dryden GM Ice Dog. Local player and team Captain, Trey Palermo, led the way earning three awards: Top Defensive Forward, Top Local Player, and Fan Favourite. Veteran player, Eric Stout, picked-up the Top Scorer and Most Valuable Player, while Rookie of the Year was awarded to Rayman Bassi. Jacob Siebenga was named the team’s Most Sportsmanlike player, and Evan Pakkala took home Most Improved Player. Maple Grove, Minnesota player, Ryan Brandt, secured the Defenseman of the Year title and the Coach’s Award was won by Curtis Magas. Goaltender Jacob Anthony was honoured with the Playoff MVP award. Co-winners of the Community Service Award were Dryden’s Graham Oliphant and Ear Falls player, Dylan Winsor. Seven 20-year old players were thanked for their contributions to the team and wished the best of luck in their future plans. 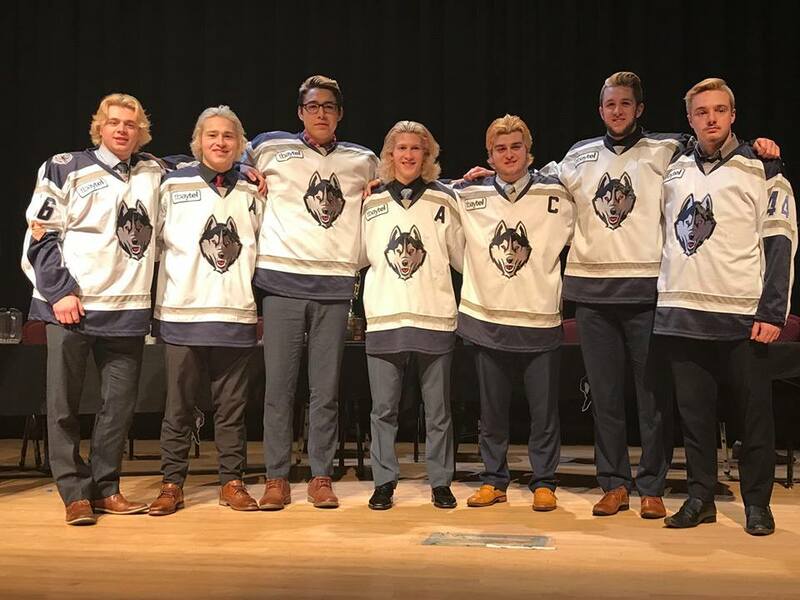 The following players completed their Junior A career in a Dryden GM Ice Dogs jersey: Cordell Boyko, Cameron Coutre, Trygve Many Guns, Trey Palermo, Kyle Sargent, Braden Shea, and Eric Stout. Dr Adam Moir was on hand to present Trey Palermo with the Dryden GM Ice Dogs bursary. The Awards Banquet capped off the 2018/19 season and the Dryden GM Ice Dogs are already making plans for 2019/20. The team’s annual general meeting is being held on Wednesday, April 24th, 2019 at 6:00 p.m, Holiday Inn Express. Election of officers will take place at the AGM and the meeting is open to the public. 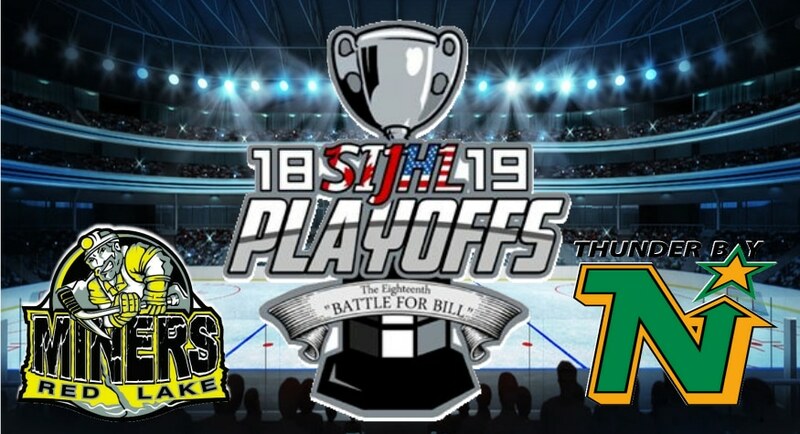 The Superior International Junior Hockey League announced Monday, April 8th the game schedule for the upcoming Bill Salonen Cup Final between the Thunder Bay North Stars and the Red Lake Miners. From there, Red Lake will host games 3 and 4 at Cochenour Arena on Wednesday, April 17th and Thursday, April 18th respectively. Should a game 5 be required, it will be held on Saturday, April 20th, back at the Gardens. Cochenour Arena would be the site for game 6, if necessary, on Monday, April 22nd. Then should the match-up go the distance, the North Stars would host in on Wednesday, April 24th. 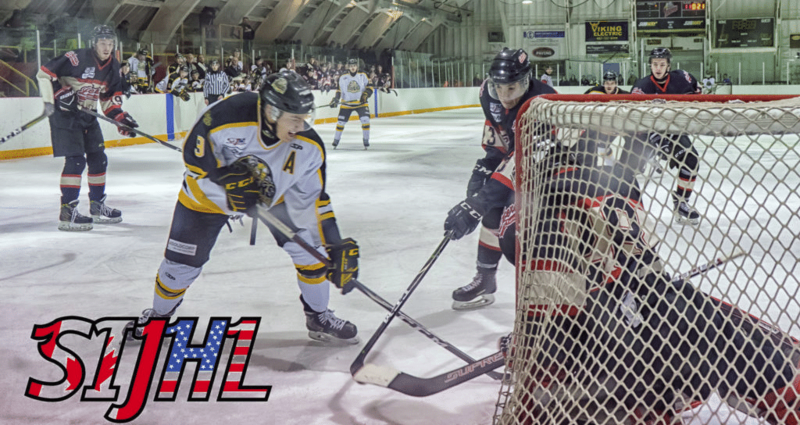 The SIJHL winner will then advance to the Dudley-Hewitt Cup Central Canadian Jr. A Championship, April 30 – May, in Cochrane, Ontario. 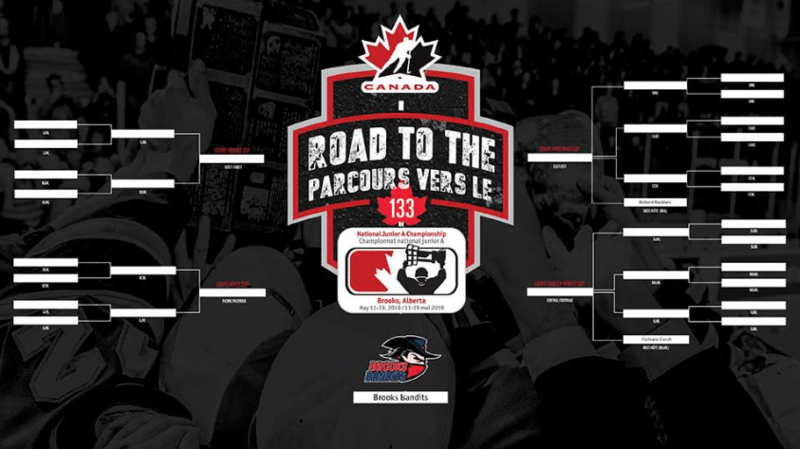 There they will go up against the host Cochrane Crunch (NOJHL) as well as the title holders from the Ontario Junior Hockey League (Wellington Dukes or Oakville Blades) and the Northern Ontario Junior Hockey League (Hearst Lumberjacks or Soo Thunderbirds/Rayside-Balfour Canadians) with a berth to the Canadian National Jr. A Championship, May 11th – 19th, in Brooks, Alberta on the line.